Stoicism is a school of philosophy founded by Zeno of Citium in Athens in the early 3rd century BC. It is predominantly a philosophy of personal ethics informed by its system of logic and its views on the natural world. Stoicism developed throughout the Roman and Greek world until the 3rd century AD, and among its adherents was Emperor Marcus Aurelius. It witnessed a decline after Christianity became the state religion in the 4th century AD. Since then it has seen revivals, notably in the Renaissance (Neostoicism) and in the contemporary era (modern Stoicism). According to its teachings, as social beings, the path to happiness for humans is found in accepting the moment as it presents itself, by not allowing oneself to be controlled by the desire for pleasure or fear of pain, by using one's mind to understand the world and to do one's part in nature's plan, and by working together and treating others fairly and justly. For Stoics, "virtue is the only good" for human beings, and that external things—such as health, wealth, and pleasure—are not good or bad in themselves, but have value as "material for virtue to act upon". For example, let's suppose that you are trying to help a drug addict and they turn out to be unwilling to cooperate. In this case, it is wiser to direct one's effort and attention towards constructive virtues such as understanding and patience than to become disheartened by the incidence. Thus stoicism teaches the development of self-control and fortitude as a means of overcoming destructive emotions. The philosophy holds that becoming a clear and unbiased thinker allows one to understand the universal reason (logos) and hence, to be free from negative emotions such as anger, envy, and jealousy. Cleanthes, a stoic philosopher, once thought that the wicked man is "like a dog tied to a cart, and compelled to go wherever it goes". A Stoic of virtue, by contrast, would amend his will to suit the world and remain, in the words of Epictetus, "sick and yet happy, in peril and yet happy, dying and yet happy, in exile and happy, in disgrace and happy," thus positing a "completely autonomous" individual will, and at the same time a universe that is "a rigidly deterministic single whole". A very important concept of stoicism is the distinction between things that are within one’s power and those that are not within our power. That is, there are things that are up to us (chiefly, our judgments and actions) while other things are not up to us (major historical events, natural phenomena, such as aging, getting ill, etc...). One path to our happiness is to differentiate between what we can change and what we can’t - what we have influence over and what we do not. For the things that we cannot control, we have to be aware that it is useless to fight an unwinnable battle. We should focus, instead, on the things that we can control. For instance, instead of losing temper when a train is delayed because of an accident, one has to concentrate on how to evaluate the event positively, to one's advantage. The events that happen to us are not inherently good or bad. However, it is within our power to decide how we value them and direct them towards our happiness. Epictetus, another Stoic philosopher, holds that if people expect to get everything they want from the universe, then they are going to be disappointed. However, if one takes whatever the universe gives and takes a positive stance about them, then one will experience a much better and happier life. 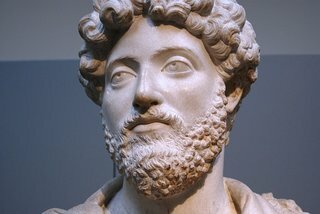 Marcus Aurelius is the founder of stoicism. Stoicism holds that external things have an influence on our happiness. One way of living a happy life is by changing the things that are outside of our control.